Welcome back to Tarleton Tip Thursdays, where every week we give you tips to help you harness the power of social media. 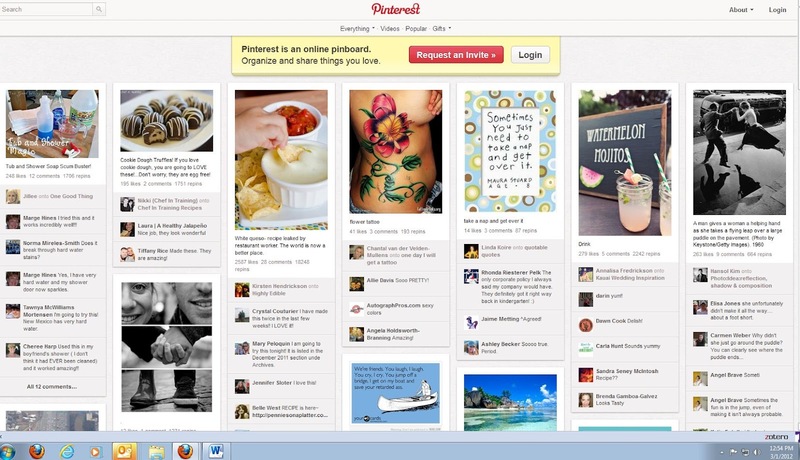 Today we'll be sharing some basic information about the new social media site Pinterest. Pinterest is the new social media kid on the block, catching up to Facebook, Twitter, and Google+ quickly, growing from 1.6 million visitors in September 2011 to 11.1 million visitors in February 2012. Pinterest is a virtual pin board where you can “pin” things from websites to specific boards or find things on the site to pin to your virtual boards. Image taken from http://pinterest.com on March 1, 2012. Google Ad Planner statistics (as reported on Mashable.com) revealed that currently women make up 82% of the active users on Pinterest. In a general trend, women engage more on social networking sites, spending 30% more time on them than men. Recently concerns have cropped over Pinterest and copyright. What about people who don't want their work pinned? For example, the photo-sharing website Flickr recently announced its intention to "block" pinning from its site. If you look closely at Pinterest's terms of service, you'll notice that they retain the right to sell images that you've pinned. At one point, the site was even using a service called Skimlinks to "monetize" users' pins. 1. Take it for a spin. Try out Pinterest for yourself with a personal account. Make sure you are thoroughly familiar with how Pinterest works before using it for business. Are you OK with people re-pinning your items, or possibly going to your site and using images and/or blog posts? 2. Get inspiration. Look at how other companies are using Pinterest. What are your thoughts about this new social media site? Hannah Miller is a Social Media Committee Intern with the Texas Social Media Research Institute and blogs at The Ambitious Cattlegirl. There's a small piece of code anyone can add to the head of any page on one' website, available on the Pinterest help page under the question, "What if I don't want images from my site to be pinned?" Of course, that's opt out, rather than opt in, which is annoying. Good point. Thanks for the info, and the comment!